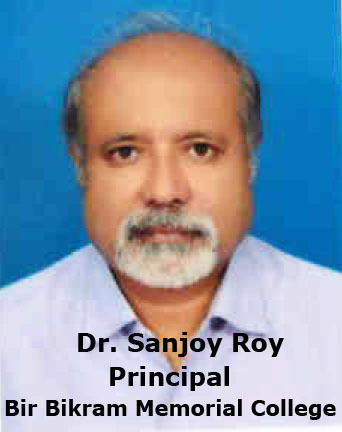 It gives me immense pleasure to express my thoughts as the Principal of Bir Bikram Memorial College , Agartala. Since its inception (Sep 19, 1969) this higher education institution has embarked upon the path of inclusive academics and is successfully fulfilling its objective of not only producing graduates but also equipping them with necessary knowledge and values, making them worthy citizens. With the support of qualified, dedicated and hardworking faculty, the college has established a vibrant, learning environment wherein the teachers and students are engaged in a collaborative partnership. This college provides an easy access to the seat of higher learning, reaching out to all the eligible persons and particularly to the vulnerable sections. The college is committed to a sustained effort to create a niche for itself in every aspect of educational process. I extend my sincere support to all the endeavours undertaken by the teaching faculty and student community and sincerely hope to make this seat of higher learning a model college of the state in the coming years.